As elsewhere around the world, expats might face some sorts of difficulties in moving in and out, finding their work places, and so on. But, from now onwards, it would be much easier for the aliens arriving in and leaving Seoul to find new home and work locations and to move in and out, with the assistance of three professionally trained ladies. Last November Ms. Michelle Ham and two other young ladies, Heather Kim and Jane Kim, teamed up to help expats with their needs here in this megalopolis. Armed with expertise and equipped with linguistic ability, the highly-motivated trios are really proud of helping newly arrived or leaving foreigners with whatever needs they have. ABA Manager Heather Kim is the co-founder of the company. She is a licensed real estate agent. Prior to becoming a certified realtor she spent some 10 years working for a trading company in Seoul. Situated in Yonsan's Samgak-ji area, the newly launched ABA Real Estate & Relocation Services is specializing in the needs of alien residents. The Seoul Times has recently visited its office and met with its President Michelle Ham and listened to her on how and why she started this and how she enjoys her work now. The interview was joined by two other co-founders of the company, Heather Kim and Jane Kim. The following is the questions and answers of the interview story. Q1: What kinds of people are your customers? And what are their needs? How do you help them? A1: My customers vary depending on their professions. They are expats, foreign embassy people, and personnel of USFK (US Forces Korea), and the expats include lawyers, journalists, and other professionals. They want their office and home in such locations as Mt. Namsan, Han River view, or park view. These people prefer environmental friendly places. But others simply prefer for their home to be located near their work place. Some expats want to move in to places near the school of their children. In most cases singles prefer to live in the urban areas. 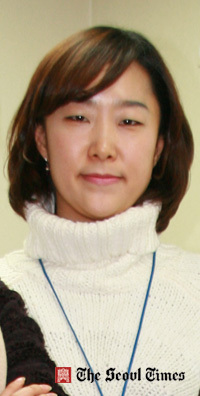 ABA Manager Jane Kim is the co-founder of the company. Jane serves as a consultant. We look for places based on the needs and budget situation of our customers. We also take care of such specific matters as internet, cable TV, water, furniture, moving in, and even maids for our customers. Q2: Among your both local Korean and foreign customers how important they are, respectively, to your business? How many of them are foreign customers? A2: We only serve foreign customers. As afore-mentioned, they are diplomats of the foreign embassy, officials of the foreign companies in Seoul, USFK personnel, and other expats of other professions. Q3: Do you specialize in foreign embassies and international organizations including USFK personnel for your business? How important are they to your business? What are their ratios? A3: Yes. That's correct. The demand and rent budget of them have been on the decrease due to the financial crisis. But diplomats of the foreign embassies and US soldiers and their dependents are still very important to the market. The rests are company officials of multi-national or trans-national corporations living in the areas of Gangnam, Yoido, and other parts of Seoul. ABA Manager Michelle Ham (center) poses with with Manager Heather Kim (left), and Manager Jane Kim in her office hallway. On the whole, some 40 percent of our customers are the foreign embassy people and USFK personnel living in the areas of Itaewon and Hannam-dong. Q4: How many of the real estate offices are there in and around Yongsan area to serve foreign clients? Compared with others what are your advantages (or competitive edge)? A4: There are zillions of real estate agents catering to the foreign customers in and around this metropolitan city. But most of them are not that professional in serving the foreign clientele. In most places only one person takes care of everything from start to finish: tour of the site, making contracts, moving, and the maintenance. This means that they are heavily burdened with the hefty workload, and if something happens to the individual, the whole process will be delayed or damaged. ABA Manager Michelle Ham (right) poses with her co-founders, Manager Heather Kim (center), and Manager Jane Kim in office. Unlike most of the other places, we work as a team in our office. A group of three highly-trained professional ladies, Heather Kim, Jane Kim, and Michelle Ham (myself), are cooperating closely and helping each other. Jane Kim and I are working as consultants, and Heather Kim, who is a licensed broker, helps us closely. So, three of us, who normally work separately, become cooperative, taking covers for others, if case of emergency. Q5: When did you open your office? Are you satisfied with your job now? When was your happiest moment or most difficult part of your work as a real estate expert dealing with foreign customers? A5: We opened our office near Samgak-ji last November. I am quite content with my work except that I am busy a little bit. ABA Manager Michelle Ham (center) poses with Manager Heather Kim (right), and Manager Jane Kim (left)in her office lounge. Heather and Jane also represents the company as its co-founder. I feel extremely satisfied when my mediation works perfectly for tenants and landlords, who each have differing conditions. In some cases to satisfy both tenants and landlords simultaneously is quite difficult and impossible due to the different backgrounds and cultural difference. And even a very tiny and insignificant thing can develop into a stumbling block for compromising the deal, which makes me agonize sometimes. But in the end, I feel relieved and happy and we become successful in persuading either side for compromising or giving in to the other. Q6: Honestly, how successful is your business? Do you have any plans to expand your business? A6: I do not want to call my performance a success yet. I have a lot more things to do. I would like to turn my company into a corporate body specializing in various parts of real estate business. 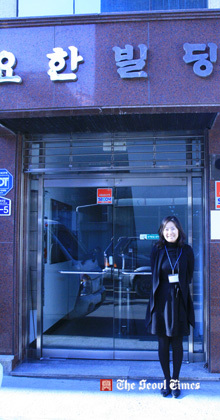 ABA Manager Michelle Ham standing in front of her office building "Yohan (John) Building" in Samgak-ji area. I want to try such areas as land, commercial building, factory, regular building, auction, apartment selling, and overseas investment, which I believe have the great potential. Q7: How many employees or partners are in your office? Could you introduce them to our readers? How do you cooperate with them? A7: As I have already mentioned, we have three professionals in our office. But, we will recruit more real estate experts to expand the areas of our real estate business. Heather is kind as usual, and she does her best to treat customers with her genuine heart. She has many foreign customers revisiting her. As highly intelligent career woman she is in charge of PR and making the contracts. Jane is very active and outgoing. She is talented in making friends. She makes our whole team always happy and comfortable. She is taking charge of marketing. When we take our customer on a tour we always do that as a team of two in our efforts to serve our customers better than any of our competitors. Q8: We guess that you have many foreign friends, perhaps you have made out of your line of business. How do you rub elbows with them? ABA Manager Michelle Ham (right) poses with with Manager Heather Kim (right), and Manager Jane Kim (center)in her office. A8: We maintain good and friendly ties with our customers through the continued meeting, and social events. We never forget their birthdays, the day of their moving in, Christmas Day, and New Year's Day, as well. On these days we send our cards and presents to them. We also cook some Korean food and share it with them. In the future, we will host regular events to invite all of our customers and friends. Q9: How do you spend your free time? What are your hobbies? What are your future plans for life? I just listen to the music or read some books to catch up with the fast changing world. Also on the regular bases, I go to a gym for weight training or go on a mountain hiking to maintain my health and to release the stresses and strains. I wish to live a happy life and share the happiness and luck with others. The happiness that I enjoy now is the one given from the God to share it with others, I believe. If possible, I would like to involve myself in some social activities to practice the meaningful sharing. Q10: Could you tell us your educational background? What did you major in at college? How helpful are your major and previous work to your current profession? A10: I majored in politics & diplomacy at Ehwa Woman's University in Seoul. I attended the university in times of national financial crisis locally called "IMF Crisis." I learned to be a strong person and my major broadened my perspectives. When at work, I always try to be balanced and flexible.